Sir Ewan Brown, a former chairman of Lloyds TSB Scotland, said it faced being left behind by international rivals if it failed to proceed with the £45 million New Town project. He said the city’s cultural sector needed to ensure its status as a world-leader for cultural festivals was reflected by offering venues “of a standard expected by today’s most sought-after performers and by audiences”. He suggested the new infrastructure was needed to keep pace with the evolution of the city’s tourism and financial industries in modern times, including the creation of new hotels, bars and restaurants. Sir Ewan, chair of the charitable trust set up to pursue the concert hall project, suggested Edinburgh would be selling itself short as a capital city if it failed to deliver the long-awaited 1,000-capacity venue. “If approved by councillors next week, it will end a 25-year-search for a new venue for “mid-scale” concerts, a home for the Scottish Chamber Orchestra and a world-class facility for the Edinburgh International Festival. The “Impact Centre” has won backing from city centre business group Essential Edinburgh, and heritage experts at the Cockburn Association, Edinburgh World Heritage and government agency Historic Environment Scotland. Some £25m worth of support has been pledged by the Scottish and UK governments, and the city council for the project, which was announced by the SCO in 2016. Sir Ewan said: “A landmark decision will be made for audiences and performers alike next week when councillors decide whether to grant planning permission for the new concert hall in the city centre. “Edinburgh city centre has constantly evolved over the years. Where we once had financial institutions, we now have restaurants and bars and a financial centre in new, purpose-built premises. “The hotel sector is growing daily, and the current challenges faced by retailers will contribute to the refocusing of our city centre. “I’ve seen Edinburgh grow into this amazing, vibrant city. However, with these rapid changes it is important to get the balance right between the interests of commercial success and the cultural heritage for which Edinburgh is renowned and which makes it a special to live in. 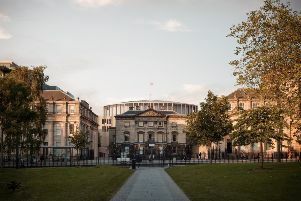 “This will be the first purpose-built music and performance venue in Edinburgh for over 100 years, which will surprise many given Edinburgh’s leading place in the world for cultural festivals. However, it’s not a position which can be taken for granted. “Admired and coveted by many other cities, it is a status we need to work hard to maintain. Not just through the range of innovative and entertaining performances staged, but by offering venues of a standard expected by today’s most sought-after performers and by audiences.